In Stock - Ready to Ship!! Like the original PVC Trampoline, but bigger and better! Higher profile, larger diameter, larger bouncing surface, and a new all elastic webbing frame system will make for higher bounce and a higher level of fun! 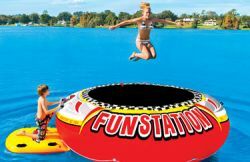 The Sportsstuff 12' Fun Station Water Trampoline has no metal frames or springs!! The Sportsstuff 12' Fun Station Water Trampoline has big, bold graphics and attractive features are bound to make this island the main attraction on a lake near you! The Sportsstuff 12' Funstation water trampoline is huge and great fun jumping. Invite all your friends to a day on the water with the SportsStuff 12' Fun Station Water Trampoline. This water trampoline is brand new in the box with a full SportsStuff 12' FunStation Water Trampoline Manufacturer warranty! !